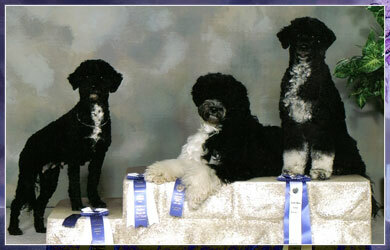 The Portuguese Water Dog is a highly intelligent and biddable friend, always striving to serve his master. This is a highly playful and fun loving breed, and enjoys all manner of games, especially with children. The Portie is friendly, sociable, and confident with other dogs and strangers, and displays heart warming kindness to smaller pets. Many PWD owners are surprised at the quick and lasting friendships these dogs forge with the family cat. Porties thrive on an active environment and their family’s constant approval and satisfaction. They are not a good choice for people looking for a "couch potato" dog. This is an active and energetic dog that craves exercise. They seem to have boundless energy and may develop behavioural problems if not kept active. Portuguese Water Dogs have unique personalities, they are never boring. They will invent their own entertainment if you do not keep them busy. At the same time, they are sensitive to your moods. My second PWD was a Pet Therapy Dog and we have dogs in Reading Programs, Chimo, and hospital visiting. They use their "hands" while manipulating objects and it is written that used to be able to climb knotted ropes into the boats. I do know that if motivated, they can easily scale a 6ft high fence.